The weekend served as a primer for No. 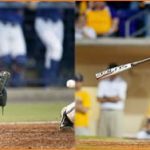 4/6 Florida Gators baseball (33-11, 17-6 SEC), which had hoped to take control of the Southeastern Conference with a sweep of the Alabama Crimson Tide (28-19, 9-14 SEC). Instead, Florida only took two of three games, leaving themselves tied with South Carolina atop the SEC standings. After earning a 9-3 win Friday, the Gators clinched their sixth-straight series with a 14-8 victory in the second game of the three-game weekend at Sewell-Thomas Stadium in Tuscaloosa, AL. 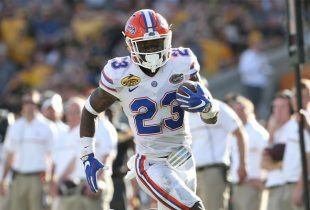 It was Florida’s season-high seventh-straight win and the first time any SEC Eastern Division opponent had defeated Alabama at home since 2004 (just the second time since 1995). Freshman designated hitter Brian Johnson (2-3) scored two runs while jacking a grand slam; freshman catcher Mike Zunino (2-4) nailed a three-run homer, and sophomore first baseman Preston Tucker (3-5) added a solo shot with two RBI. Sophomore starter Alex Panteliodis (8-2) tossed six innings for the win. The Gators were unable to put away the Crimson Tide on Saturday, allowing Alabama junior shortstop Josh Rutledge (3-5) to power his team with a career-high six RBI for their only victory of the series. Sophomore reliever Anthony DeSclafani (2-3) picked up the loss for Florida, but Johnson’s start and subsequent six runs allowed in 3.1 innings of work was the main reason for the loss. UF and USC (36-11, 17-7 SEC) will now duel it out over their last six conference games (two series) to determine who will take home the regular season crown. And considering the two teams will face-off in the final three games of the season in Columbia, SC, there is a possibility that the championship may be played for in the season finale on May 22.